Ann Morgan is a local artist, who has painted and exhibited for many years in the Island. She paints in oils, watercolours and acrylic, mainly getting her inspiration from the sea, rocks and landscape. People often feature in her work. She is particularly interested in the effect of surface light on her chosen subject. She is also a portrait painter and takes on commissions in this field. Ann teaches art through Highlands Adult Education programme, and also teaches at the Art Centre in Phillip Street. 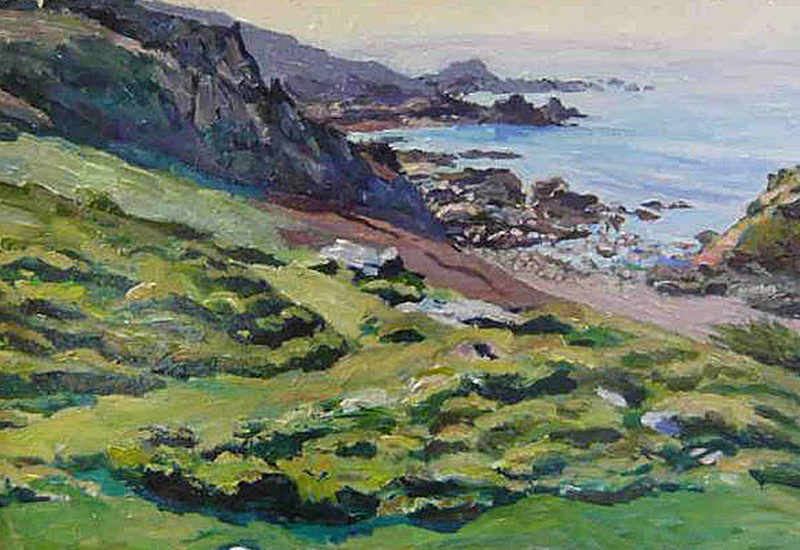 She takes groups for private outdoor workshops and has undertaken workshops for groups of people such as the Society of Jersey Artists, and The Art Exhibitors Guild. Ann won Second prize in the JJ Fox Exhibition in 2003 and has had work selected for this Exhibition. She has also exhibited with the Society of Women Artists in London.Anne’s first Solo Exhibition was “Surface Light” at Studio 18 in October 2007. Previous to this she had a joint exhibition with fellow artist Kathy Rondel also at Studio 18. More recently she has exhibited through Harbour Gallery and is now exhibiting with Victoria Art Gallery.